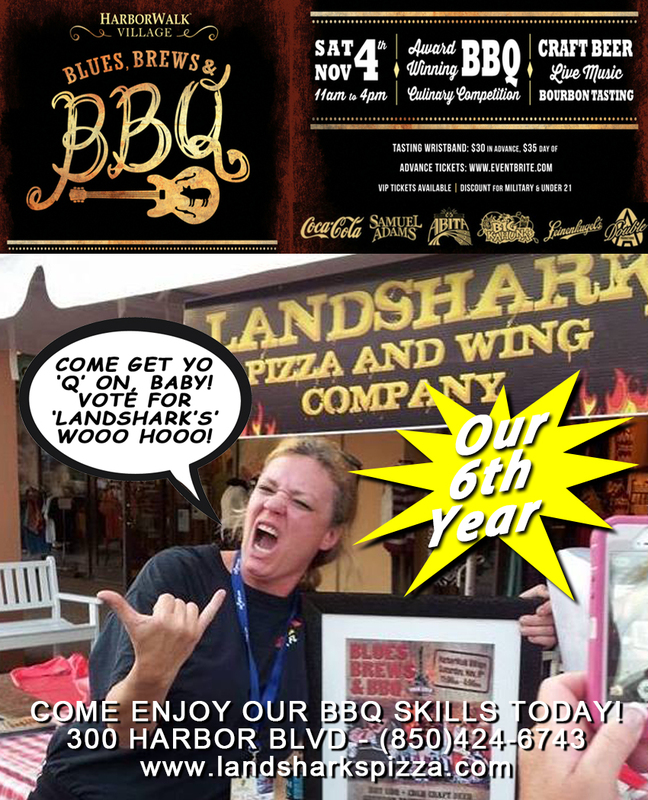 It’s Landshark’s POKER NIGHT! 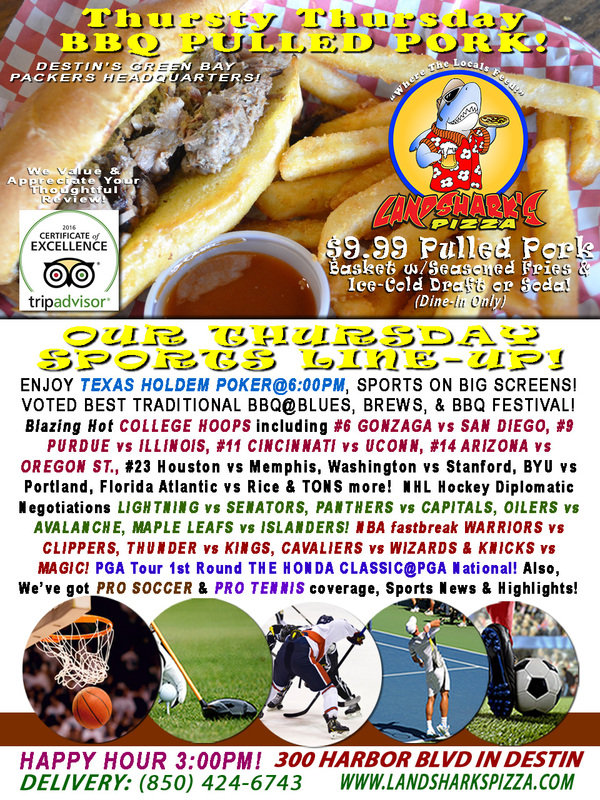 GONZAGA, WARRIORS & CAVALIERS Hoops! 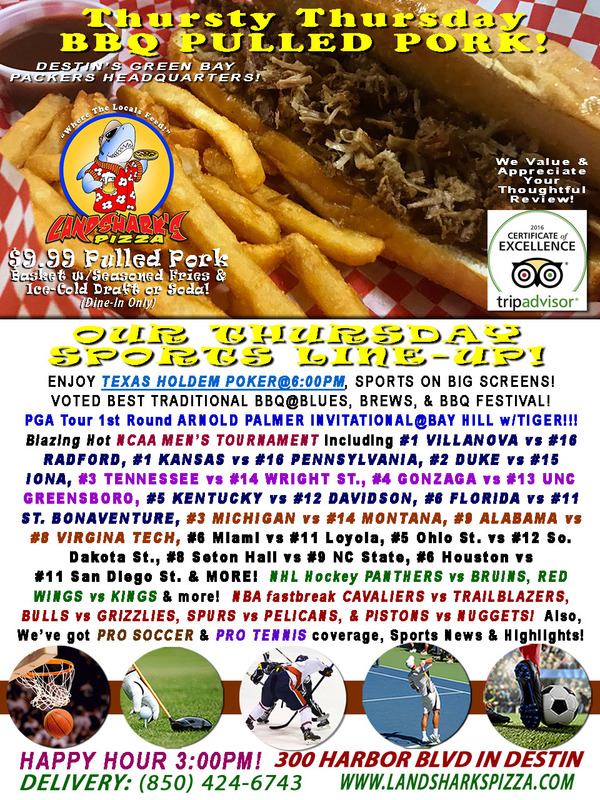 BEST BBQ & Brew$9.99|TEXAS HOLD’EM 6PM! 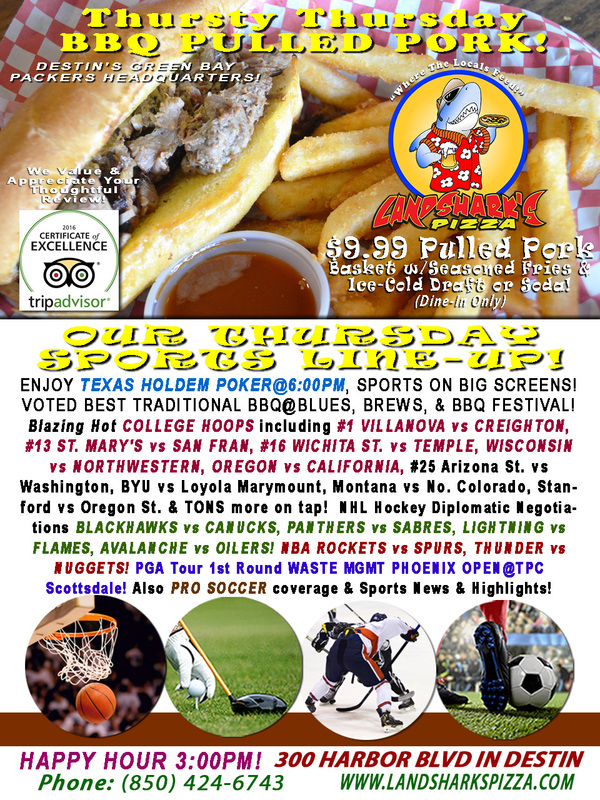 #1 MICHIGAN ST vs MARYLAND plus TEXAS HOLD’EM POKER at Landshark’s in Destin BBQ & Brew $9.99|NBA, PGA, NHL & More! 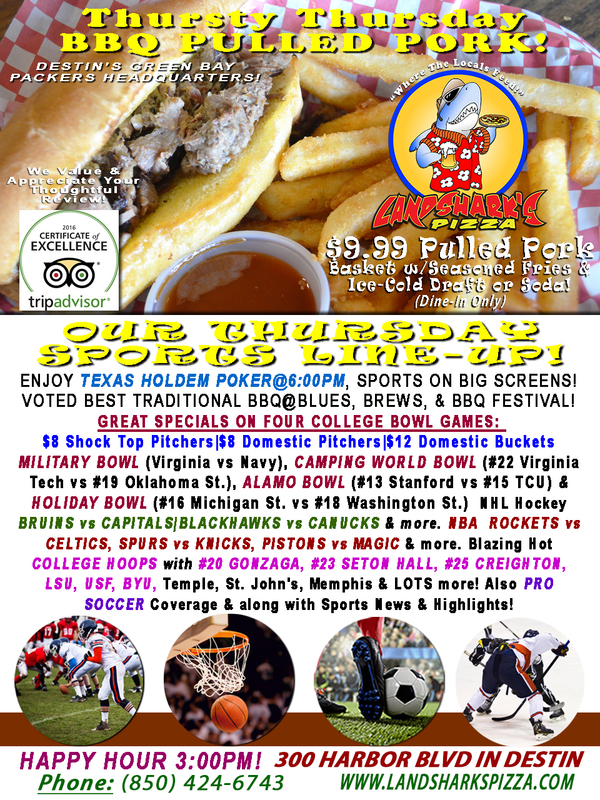 Landshark’s Best Traditional BBQ & Brew $9.99 & FOUR BOWL GAMES, GAME SPECIALS plus TEXAS HOLD’EM POKER! 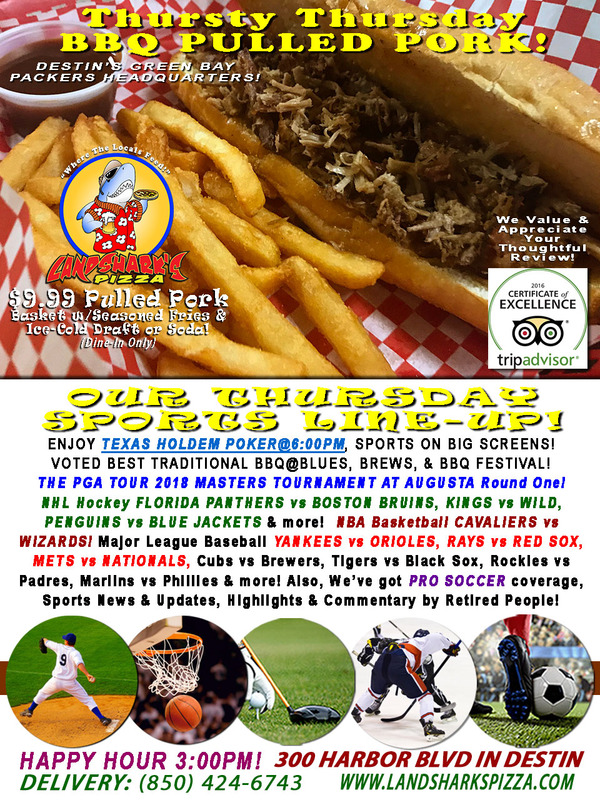 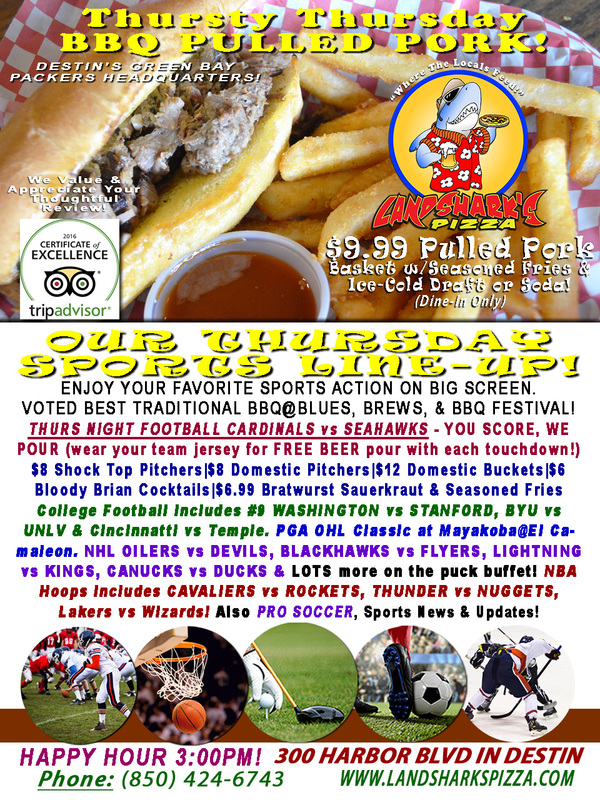 Landshark’s Thursty Thursday STEELERS vs TITANS|You Score, We Pour & MORE Specials! 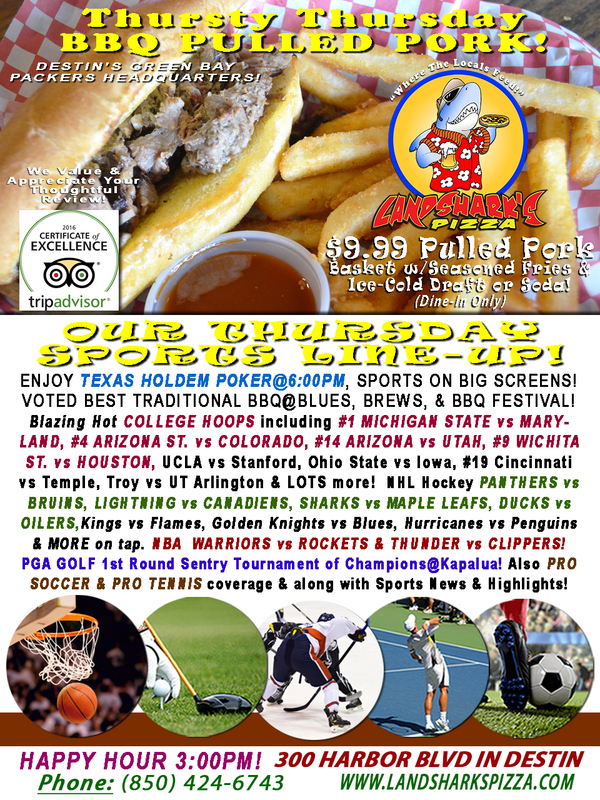 $9.99 BBQ Basket, NBA, NHL & More! 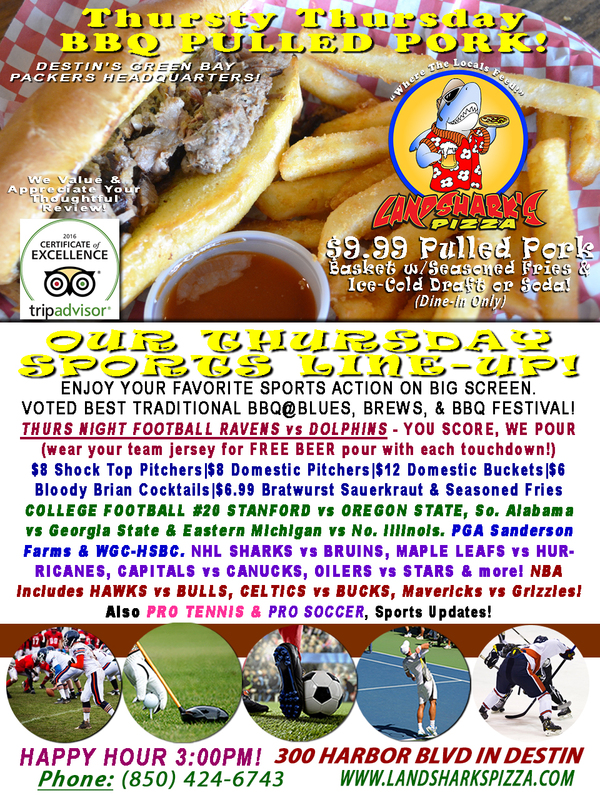 Landshark’s SEAHAWKS vs CARDINALS|You Score, We Pour & MORE Specials! $9.99 BBQ Basket, NBA, NHL & More! 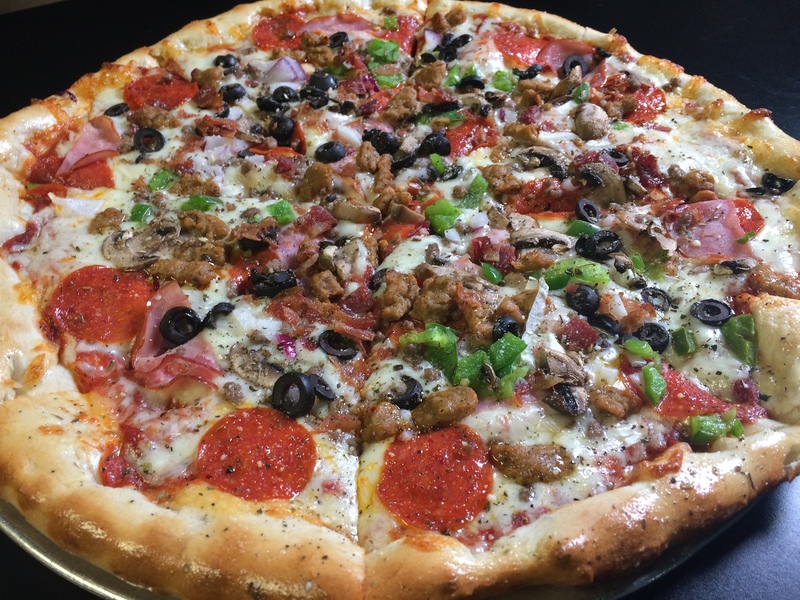 Landshark’s RAVENS vs DOLPHINS|You Score, We Pour & MORE Specials! 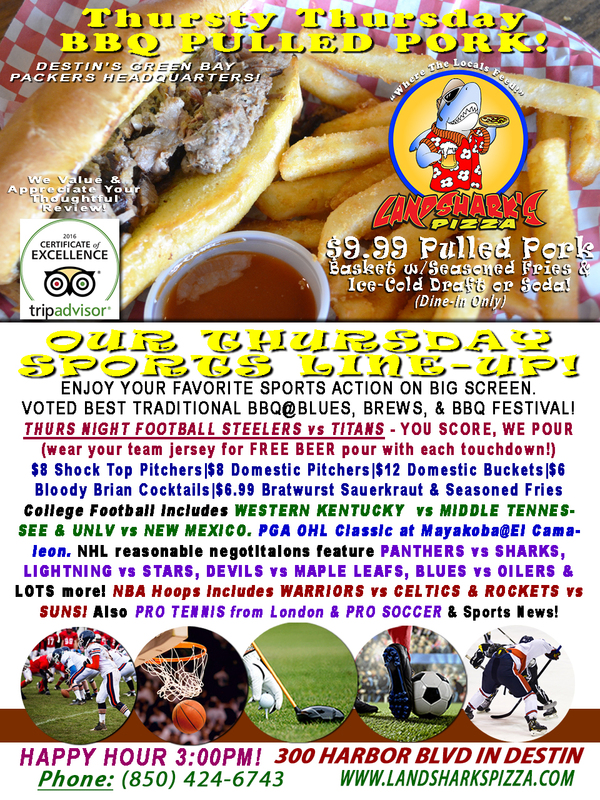 $9.99 BBQ Basket, NBA, NHL & More! 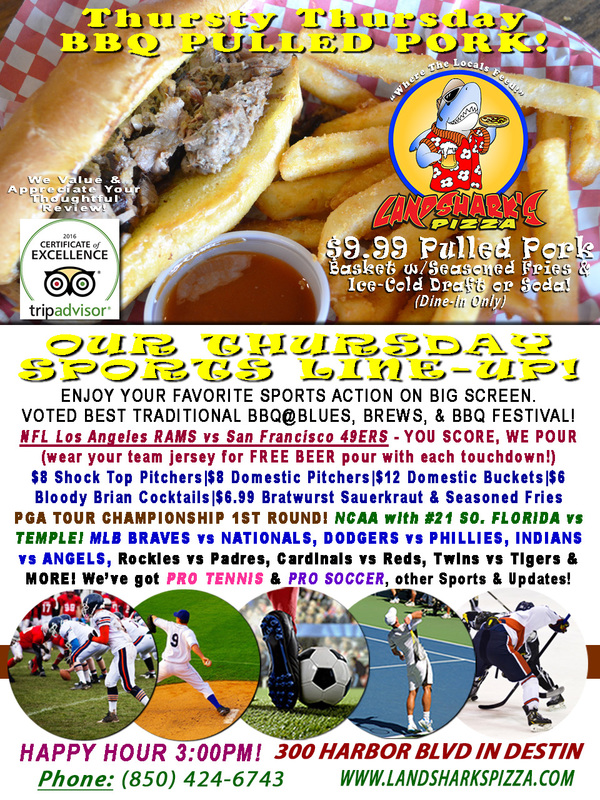 NFL & NCAA FOOTBALL with ‘YOU SCORE, WE POUR’ NFL Specials, NHL, PGA & MLB, $9.99 BBQ Basket & Draft or Soda!